Born in Virginia, Thomas Woodrow Wilson was the son of a Presbyterian minister who was briefly a chaplain for the Confederate Army, and later a theology professor who after teaching at Southern colleges obtained a faculty position at the College of New Jersey, where his son transferred to enroll as a student. Graduating in the class of 1879, Wilson then studied law at the University of University of Virginia and practiced for a year as a lawyer before enrolling in 1883 at Johns Hopkins University, where he received a doctorate in political science in 1886, soon publishishing his first book arguing for the advantages of parliamentary system over the US model of separatng executive and legislative power. After teaching at Cornell, Bryn Mawr and Wesleyan, in 1890 he was appointed as Chair of Jurisprudence and Political Economy at the College of New Jersey while concurrently lecturing at New York Law School. After the College of New Jersey changed its name to Princeton University in 1896, Wilson gained attention as a popular teacher and public speaker. 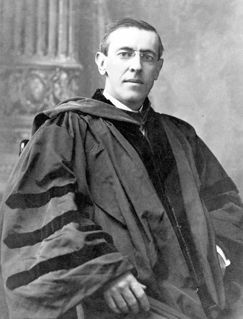 In 1902, following the publication of his fourth book, the five-volume History of the American People, he was appointed president of the University. At the Princeton Sesquicentennial in 1906, his talk, "Princeton in the Nation's Service," was praised for its criticism of the school's few alumni achievements in public service. As president, he aggressively raised funds for its endowment; expanded size of the faculty; restructured the curriculum; and strengthened admission and grading standards. But he also sparked opposition from faculty, alumni and students to his efforts to end the elite dining clubs and force the graduate school to locate on the undergraduate campus. But he also sparked opposition to his efforts to end the elite dining clubs and force the graduate school to locate on undergraduate campus. In 1910, after the Princeton board of trustees overruled his plans on the dining clubs and graduate school site, he responded positively to a request from Democratic Party bosses, including New Jersey's US Senator James Smith, Jr.. to become a Democratic gubernatorial candidate. Despite the background of his entry into the race, his campaign stressed electoral reform and the need to combat corruption. 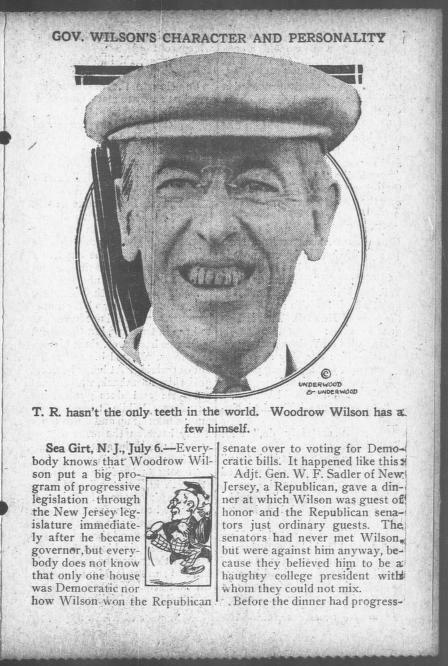 In the general election, he defeated Republican Vivian Lewis by over 650,000 votes, only two years after Republican William Howard Taft had won New Jersey in the presidential election by over 80,00 votes. After he was sworn into office in January 1911, he split with Democratic bosses, notably US Senator Smith, whom he refused to support for re-election (when the state legislature still elected senators) and endorsed Smith's opponent James Martine, who was elected. As governor, he pursued a progressive agenda, successfully gaining approval of legislation to regulate rates and operations of public utilities; open up the primary election process and weaken control of political bosses; and strengthen penalties against corruption. Perhaps most notably, he became the first governor in the nation to create a workers' compensation system to assist laborers injured on job, a principal goal of the national labor movement. During the time when the 1844 state constitution prohibited governors from running for successive term, national leaders soon encouraged Wilson to seek the presidency in the 1912 election. At the Democratic National Convention, a deadlock among frontrunner House Speaker Champ Clark, Ohio Governor Judson Harmon, Alabama Congressman Oscar Underwood and Wilson was only broken on the 46th ballot, after William Jennings Bryan--the Democratic nominee in 1896, 1900 and 1908--announced his support for Wilson, thus giving him the final votes needed for nomination. In the general election, Wilson's victory was largely due to a bitter split among the Republicans, with President William Howard Taft nominated to run for re-election and former President Theodore Roosevelt, who had repudiated Taft as abandoning progressive reforms, running an independent campaign as the nominee of the Progressive, or "Bull Moose," Party. In the three-way election, Wilson received only 42% of the popular vote but won with a large margin in the Electoral College with 435 votes to 88 for Roosevelt and only eight for Taft. 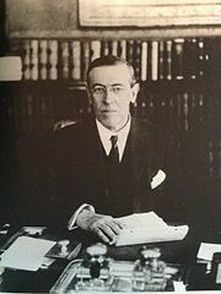 After he resigned as governor shortly before his inauguration in Washington, Wilson successfully pushed for a lower tariff; a graduated federal income tax to replace the lower tariff revenues; regulation of financial markets through the Federal Reserve Act; the creation of the Federal Trade Commission to prohibit unfair business practices; a ban of child labor; and a limit on work days to eight hours for railroad workers. In August 1914, his wife Ellen died of kidney disease in the White House; in December of following year, he married Edith Bolling Galt, a widow and Virginia native who had been introduced to him by his cousin, Helen Bones, who had served as official White House hostess since the death of Ellen Wilson. In his first term, Wilson resisted calls to enter the war in Europe, narrowly re-elected in 1916 with supporters claiming "he kept us out of war" by nearly 600,000 votes--but only a 277-254 margin in the Electoral College--over his Republican opponent, former Supreme Court Justice Charles Evans Hughes. Wilson's re-election marked the first time that a Democratic Party candidate had won two consecutive Presidential elections since Andrew Jackson won in 1828 and 1832. But soon after inauguration to second term, Wilson asked the Congress on April 2,1917, for a declaration of war against Germany, citing German provocations in attacks on shipping and refusal to respect US neutrality.